Following the success of Trucks: Whizz! Zoom! Rumble! and Trains: Steaming! Pulling! Huffing! PATRICIA HUBBELL introduces the third installment to her popular series featuring "things that go!" 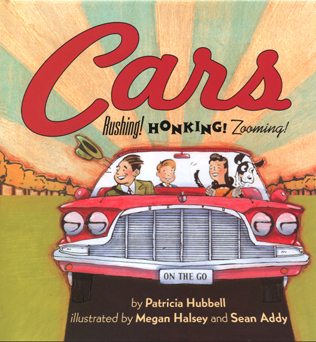 SEAN ADDY and MEGAN HALSEY portray a variety of cars using vibrant clip art, etchings, and original drawings, making this a perfect gift for children who love things that go! All kinds of cars, from sedans to SUVs to station wagons, take people here, there, and everywhere. LOOK for Trains and Trucks, too!